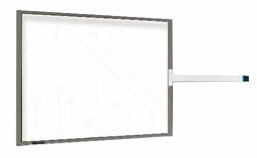 The analog resistive 5-wire touch screens by Abon Touch are available in sizes from 10.4″ to 19″ (26.42 cm to 48.26 cm), very robust and can be operated even with gloves or a stylus. The controller ETP-MB-MER4050UEBG and the appropriate cables connect the touch screen with a USB interface. Abon touch panels as an HID (digitizer) device and their controller communicate with the PC system directly through USB without the need of an additional driver in most of the cases. In cases where you need an additional driver, the touch driver emulates mouse left and right button by pressing, respectively pressing and holding and supports various operation systems, such as Windows, Linux, QNX and MacOS. With Abon touch screens you will experience superior performance in sensitivity, accuracy and reliable operation.